Former TD Sean Calleary who has died, aged 86, was truly a man of the people, and a gentleman through and through. But he will be particularly remembered as the caring public representative whose door was always open to constituents. Sean was a native of Killala where he attended the local National School. His later education followed at Garbally College and University College College, Galway, from which he graduated as a civil engineer. His entry on the political scene began in 1967 when he was elected as a member of Mayo County Council, serving there for the next twenty years. He was a member of Ballina Urban District Council from 1981 to 1987, a body of which was twice chairman in 1983 and 1985. He was elected to the Dail in 1973, following in the footsteps of his father, Phelim, who had been a TD for Mayo from 1952 to 1969. During his 19 years in the Dail, Sean served as Minister of State at the Department of Public Service, Minister of State at the Department of Trade, Commerce and Tourism and later Minister of State at the Department of Foreign Affairs. 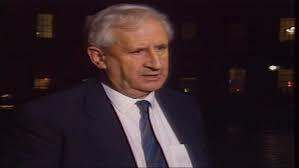 Former Taoiseach Enda Kenny said: “Seán was a fearless defender of Ballina and Mayo. “As an engineer, he brought the quality of strategic thinking to his politics, particularly in respect of the development of the west. Former Commissioner and Minister Padraic Flynn, a party colleague of Sean, paid tribute saying Sean made a huge contribution at community, county and national level. Chairman of Mayo Fianna Fail CC said Sean’s love for Mayo, “particularly his native North Mayo, shone through his politics and his non-political pursuits, especially his passion for sports. “His quiet demeanour on and off the political field belied a sharp and curious brain which retained facts and brought them back at will whatever the discussion and made Sean a pleasure to chat to on any topic. “He was always to be found deep in conversation, giving his viewpoint on the issues of the day. It’s fitting to remember Sean for what he was, a gentleman, as he was considered across the political divide to be, willing to talk to anyone on an issue and show the greatest respect to all, even those he disagreed with. Outside politics, Sean’s great passion was sports. He excelled in athletics, hurling, Gaelic football and soccer. He played rugby for Galwegians and Connacht, doing so under an assumed name because of the ban on GAA members engaging in rugby at the time. He later served as president of the Connacht Rugby Branch in 2006-2007. He played inter-county football for Mayo at junior level and served as a senior selector. He also played in the neighbouring county, where he won a Sligo senior football championship medal in his wife’s homeplace, Easkey in 1966. His sports achievements were recognised by The Western People who inducted him into their Hall of Fame. In a eulogy at his funeral Mass in St. Muredach’s Cathedral, Ballina, Fianna Fail leader Micheal Martin spoke of Sean’s concern for the world’s poorest during his term in foreign affairs from 1981 to 1987. “He worked tirelessly to ensure that projects funded by Ireland were as effective as possible,” he said. He also recalled that in 1990, deputising for the Taoiseach of the time; Sean became the first Mayoman to present the President of the United States George H.W. Bush with a bowl of shamrock on St. Patrick’s Day in the Oval Office. The main celebrant of the funeral Mass Bishop of Killala, Dr. John Fleming, spoke of Sean’s gentle nature and caring personality, describing him as ‘a Christian politician’ who worked for the common good. Sean’s son Dara, Deputy Leader of Fianna Fail, said his father was a man who made massive sacrifices to give his family huge privileges during their lives. ‘One of the greatest privileges was to have a ringside seat at one of the world’s greatest love stories Sean and Doris. They were devoted to each other,’ he said. President Higgins and the Taoiseach Leo Varadakar were represented at the funeral by their respective aide-de-camp. The attendance also included many current and former members of the Oireachtas. They included former Taoisigh, Enda Kenny, Brian Cowen and Bertie Ahern. Mayo County Council was represented by Peter Hynes, chief executive, Councillor Richard Finn, cathaoirleach and other members of the authority. Members of Fianna Fail formed a guard of honours as his remains were taken across the River Moy to Leigue Cemetary in Ballina. Ar Dheis Dé go raibh a anam dhílis. Previous PostNow, rural households must pay for upkeep of public roads…or elseNext PostDoors open for the Sean MacDiarmada Summer School in Leitrim this weekend.